Check out our specials and save cash!!! Specials change each month, and can include sales on different stove models, discounts on shipping and crating , bargains on full color changes , re-chroming and more… Be sure to use the codeword HotStove when ordering to take full advantage of these deals. $500 off on the O’Keefe & Merritt Model 850 stove. Dimensions are 38.5″W X 28′ D X 54″H. 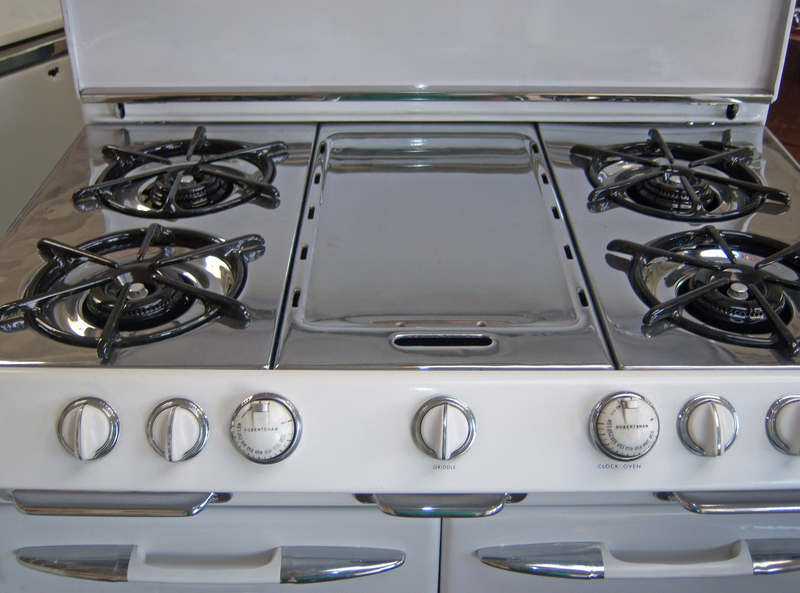 The cooktop is 36″H .. 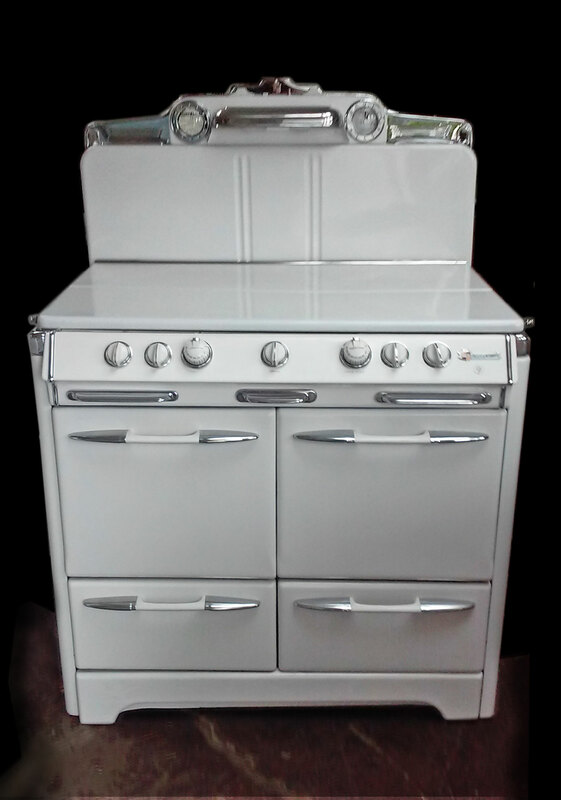 This classic 1950’s beauty comes with two 16″wide ovens and two pull out broilers below. It also sports a center griddle for your Sunday pancakes; an incandescent light; drop-in salt & pepper shakers; and the “Vanishing Shelf,” which operates in three modes: folded down over the cooktop when not in use, folded flat against the backsplash, or locked up at 90 degrees against the backsplash to serve as a baker’s shelf to cool your pies. The Model 850 also has the advantage of superior cook-ability. The constancy of the thermostats and oven temperature is much valued by bakers and chefs alike. The ovens, with their thick porcelain finish, retain and distribute heat (with a rating of 20,000 BTUs) so well there’s no need for any type of convection contraption. 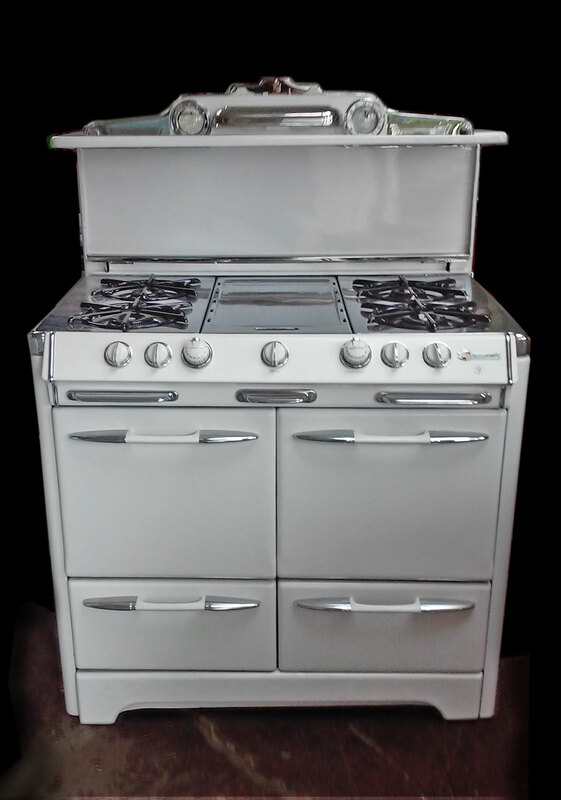 This of one of the best stoves ever made, and will give you many years of reliable and happy cooking! Act now!There is only one left and ready to go! And Remember to use the codeword “HotStove”, and happy cooking!! !